Visit http://www.charlesmokotoff.com to hear his music! My friend Charles is a classical guitarist. I photographed him playing his guitar for his website and this was one of the head shots I did at the end of the session. Visit http://www.charlesmokotoff.com to learn more! I just completed this CD package design for AAMHL (Association of Adult Musicians with Hearing Loss). They are publishing the project through Amazon’s CreateSpace, so the CD will be available for purchase shortly. 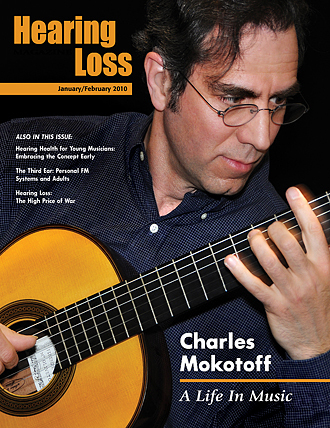 My friend, Charles Mokotoff, plays two pieces on “Hear This!” I photographed Charles for the feature he wrote for the January/February 2010 issue of Hearing Loss Magazine. You can see that post here. Design © Cindy Dyer/Dyer Design. All rights reserved. Celloist PAUL SILVERMAN has performed at Carnegie Hall, the Kennedy Center Concert Hall and the Strathmore Music Center. Pianist, soloist and chamber musician JENNIFER CASTELLANO was commissioned to write music for the North/South Chamber Orchestra and was named the 2012 Commissioned Composer for New Jersey Music Teachers Association. Pianist KATHRYN BAKKE received her Masters degree in Piano Performance from the University of Minnesota. She is a speaker, writer and advocate for better hearing loss access. Singer/songwriter and certified hearing aid dispenser ELISSA LALA has made a career singing vocals for TV documentaries; she was hired by Aaron Spelling to sing “All the Things You Are” for the ABC miniseries Crossings. My friend and classical guitarist, Charles Mokotoff, shared this with me this morning. He is being interviewed, along with violaist Wendy Cheng, on WAMU 88.5 FM’s website, Metro Connection. Both are members of the Association of Adult Musicians With Hearing Loss (AAMHL). There will be a podcast of the interview and performances at 1:00 p.m. EST today. The podcast will available on the Metro Connection website at 2:00 p.m. EST. From the small world department: I designed and produced a book a few months ago for AAMHL, working with Wendy Cheng and the book’s editor, pianist Cherisse Miller. (My Hearing Loss Magazine editor, Barbara Kelley, referred Wendy to me). 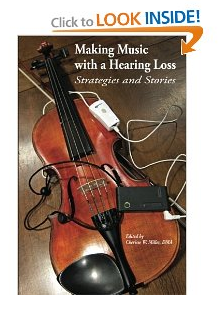 The book, Making Music with a Hearing Loss: Strategies and Stories, is available on Amazon here. You can see more of my photos of Charles, as well as listen to some of his other pieces and order his CD, Autumn Elegy, on his website here. Charles was the cover feature story for the January/February 2010 issue of Hearing Loss Magazine, which I design and produce bimonthly for the Hearing Loss Association of America. Read more about his cover debut here. Charles played for us at our first-ever Tapas Party in November 2009, recapped here. I shot the photograph below during a recital in November 2009 and blogged about that session here. Charles was interviewed last December by Japan’s Gendai Guitar magazine and a photo I shot of him was included here (so I can say I’m published internationally now!). The first issue in 2011 of the Hearing Loss Magazine (HLM), published by the Hearing Loss Association of America (HLAA), just arrived in member mailboxes this week. I design the bimonthly magazine and provide photography services. Reflecting back on 2010, I photographed Charles Mokotoff, a classical guitarist and IT specialist from Maryland; Lois Johnson, a former librarian and now the state director of the Texas State Office of the HLAA Chapter in Houston; Jennifer Thorpe, a wife, mother of five, avid blogger and hearing loss advocate from Tennessee; Craig and Lisa Yantiss, and their young son, Anthony, from Virginia; and Lisa Fuller Seward, a missionary back in the states from an assignment in Mali. These cover subjects are in the links below. To view the corresponding pdf links, click on the link, then on the same link again in the next window. The pdf should begin to download and open automatically. 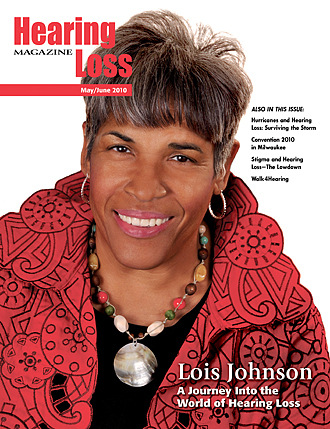 May/June 2010: HLAA member Ettalois (Lois) Johnson graced this month’s cover with her article, A Journey into the World of Hearing Loss. For more than 20 years Lois has suffered from Meniere’s disease, a disorder of the inner ear that can affect hearing and balance. She was diagnosed at age 38, after having migraines, vertigo and tinnitus. Less than six months later, the hearing in one ear had greatly diminished. Ten years later, the hearing in her “good” ear also had deteriorated to the point that she decided to pursue a cochlear implant. She became actively involved with her local HLAA chapter in Houston and attended her first HLAA convention in 1991. She hasn’t missed an HLAA convention since! Also in this issue: Hurricanes and Hearing Loss: Surviving the Storm by Lise Hamlin; Stigma and Hearing Loss—The Lowdown by Mark Ross; Invisible No More by Michael Eury; Getting Her Life Back—This Could be Your Story by Barbara Kelley; Let’s Hear it from the (Walk4Hearing) Teams: How Alliance Groups Work by Ronnie Adler and Rebecca Lander; and The Color of Quiet by Mary McCallister. Read my post about Lois on my blog here. 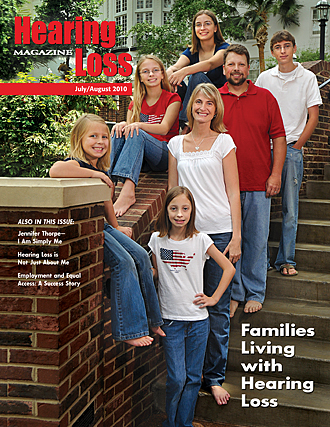 July/August 2010: HLAA member Jennifer Thorpe and her family (husband Dicky, son Will, and four daughters—Katie, Rachel, Claire and Ellie) graced this month’s cover. Jen wrote I Am Simply Me, sharing how hearing loss affects the family dynamic. Jennifer lost most of her hearing around age four and now has two cochlear implants. Also in this issue: Hearing Loss is Not Just About Me by Cathy Kooser; Let’s Hear from the Families by Barbara Kelley; Employment and Equal Access: A Success Story by Lise Hamlin; What’s On Your Mind? A Question for the Psychologist by Michael A. Harvey; and My Dad, the Ford Man by Tom Hedstrom. Read my post about Jennifer and her family here. 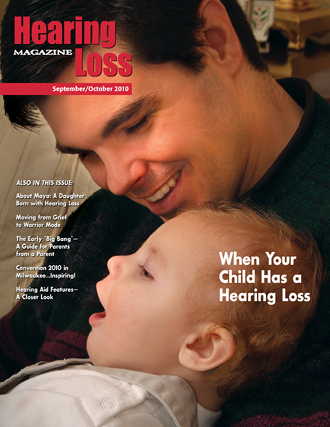 September/October 2010: This issue focused on children with hearing loss, featuring Craig Yantiss and his son Anthony. Anthony’s mother, Lisa, shared her story with Barbara Kelley in We Thought the Test Was Wrong. Anthony failed the newborn hearing screening twice and was later diagnosed with profound hearing loss in both ears. He wears a hearing aid and has a cochlear implant. 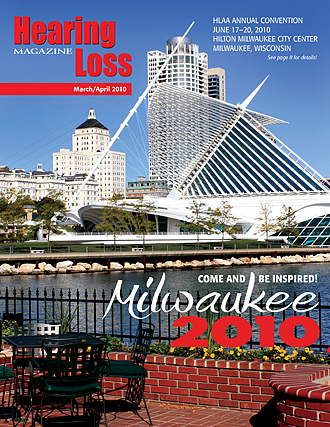 Also in this issue: About Maya: A Daughter Born with Hearing Loss by Robyn Bittner; Moving from Grief to Warrior Mode by Christina Marmor; The Early “Big Bang”—A Guide for Parents from a Parent by Marcia Finisdore; Convention 2010 in Milwaukee…Inspiring! by Nancy Macklin; Cell Phones Age into Hearing Aid Compatibility by Lise Hamlin; Hearing Aid Features: A Closer Look by Mark Ross; and The Boy Who Did a Good Deed by AJ Traub. Read my post about this issue here. 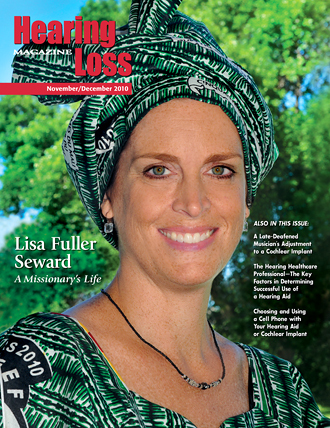 November/December 2010: The final issue of 2010 featured HLAA member Lisa Fuller Seward and her article, A Missionary’s Life, chronicling her adventure with hearing loss through the “Dark Continent.” In 2008 she “went from being a healthy 41-year-old wife and mother, living overseas and loving serving my family and God to being sick, then hospitalized, then deaf—permanently.” After a bout with malaria (very common in the area and not her first experience with it), the new medicine she was on caused her kidney function to elevate. She was then given an antibiotic that was ototoxic (toxic to the hearing system), and because of her kidney problems, it had a catastrophic effect on her cochlea. The dosage she was told to take was four times the amount usually prescribed. She was deaf for six months before pursuing a cochlear implant back in the U.S. Her first implant surgery was in September 2008. She now has two cochlear implants. Also in this issue: We Move Forward When We’re Ready by musician Richard Reed; The Sounds of Music—Strategies for Improving Music Appreciation with a Cochlear Implant by Donna L. Sorkin; Choosing and Using a Cell Phone with Your Hearing Aid or Cochlear Implant by Lise Hamlin; Convention 2011—A Capital Experience by Nancy Macklin; The Hearing Healthcare Professional—The Key Factors in Determining Successful Use of a Hearing Aid by Mark Ross; Purchasing a Hearing Aid—A Consumer Checklist; and From Invisible to Invincible by Shifra Shaulson. Check out my post about Lisa here. Download Lisa’s article in pdf format by clicking the link here: LisaFullerSeward. Do you have a hearing loss or know someone who does? Consider membership in the Hearing Loss Association of America. Student annual dues are $20, individual annual dues are $35, and family/couple annual dues are $45. All memberships include discounts on hearing-related products, convention and special event early bird discounts, AVIS and Alamo car rental, Costco membership, and the award-winning Hearing Loss Magazine. Sign up for membership here. I popped over to the Old Town Hall in Fairfax to photograph Charles at a recital this morning. He was part of the Friday Morning Music Club concert series. All FMMC concerts are free and performed as a public service. The Old Town Hall is a lovely place to photograph with its hardwood floors and original old windows with beautiful natural light. I got a few more images to use in the feature layout of the upcoming January/February 2010 issue of Hearing Loss Magazine. Berbiguier: Trio For Flutes, Op. 51, No. 1 (Mvmts. i-iii); Albéniz (arr. Bill Holcombe): Tango from España (performed by Yvonne Kocur, Lauren Sileo, and Holly Vesilind—flute trio). You can listen to Yvonne Kocur’s graduate flute recital at George Mason University here. Listen to Lauren Sileo in a recording with pianist Bryan Wagorn here. Albéniz: Selected solos, Charles Mokotoff, guitar. You can hear snippets of Charles’ music on his website here. Sondheim: One More Kiss; Porter: So in Love; Weill: What Good Would the Moon Be? ; and Rossini: Una voce poco fa (Il Barbiere di Siviglia), Stacie Steinke, soprano. Steinke is the Artistic Director for Make-A-Scene Music and Entertainment. 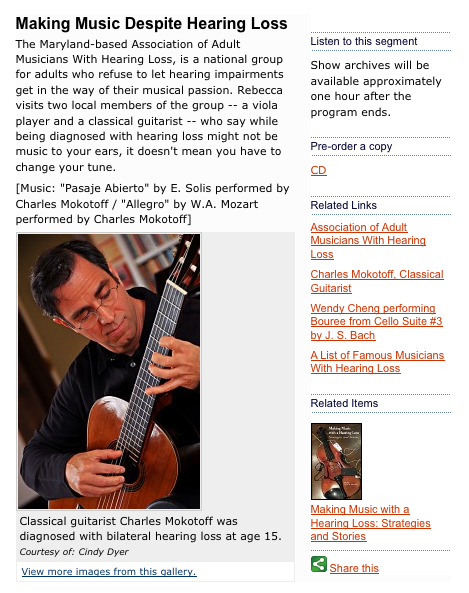 Charles Mokotoff is our next cover feature for the Hearing Loss Magazine. 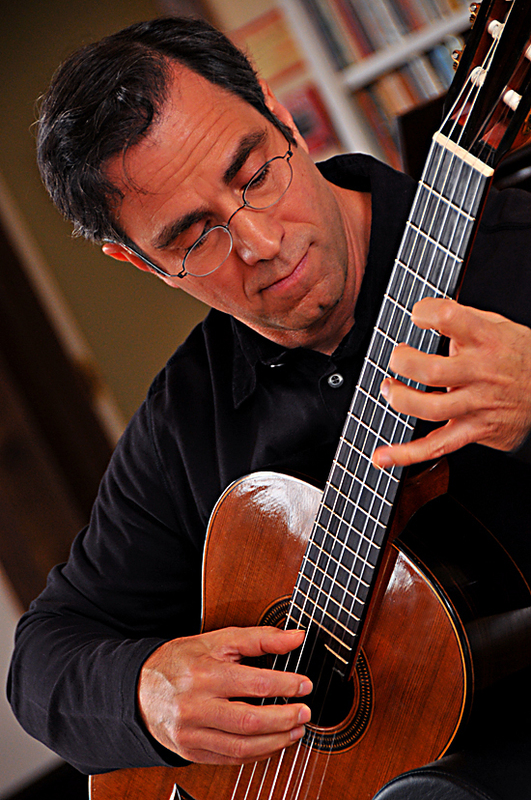 An IT specialist with NIH by day, he’s also a classical guitarist. Michael and I met him at the Hearing Loss Association of America headquarters in March. He performed for the HLAA staff and I did some studio shots for his upcoming feature article. He came by my studio earlier this week so we could get some additional images for the upcoming January/February 2010 issue. In exchange for these additional photos, he’s going to perform at our Tapas Potluck Party this coming weekend and we’re excited that we’re going to have live music! I also shot the photos on his website here. You can hear sample soundbites here. Insert useless information here: During our Vegas-to-Kodachrome Basin-Bryce-Moab vacation many years ago, my cousin Bill and I were at a casino in Las Vegas. While we were waiting in line at a hotel restaurant, Judy Tenuta walked down a ramp right past us. I had only caught her act just a few times on tv, but I knew who she was immediately—the result of a photographic memory, I guess. Hey Josh—have your people call my people!